Almost 11 years ago, I did a very bad thing. 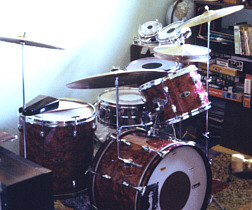 I had my first drumkit stacked on shelves in my garage, taking up space and collecting all manner of dust and corrosion. The original Crest in the seventies! It was a Crest Deluxe (60's Pearl stencil brand) in red pearl finish. A four piece kit (9x13, 16x16, 14x20, 5x14 snare) that my parents bought for me when I was 12 years old for $50 used in 1973. It got me all the way through high school garage bands and right up to the point of auditioning for a band that was scheduled to open for Dire Straits on a national tour (I got the gig but turned it down to attend U.C. Berkeley instead). 11 years ago, I took it down off those garage shelves, stripped off a few of the least rusted pieces of hardware and stepped on the shells to crack them into pieces small enough to fit in the garbage can. It wasn't long before I started to regret that barbarous slaughter. So I began planning my atonement. I could recreate it! I had built a snare and a couple of add-on toms for my Tama kit using Keller shells. I scoured the drumbuilding forums for ideas. I scoured the net for suppliers. The original Crest had Gretsch copy lugs, Slingerland-style "stick-saver" hoops, Slingerland-style bass drum "T's" and a rail consolette. I would never be able to find enough Crest lugs in good condition so I had to settle for real Grestch. The T's were not too hard to find on Ebay, and the stick saver hoops got upgraded to Pearl diecast hoops (the edge looks a little like a sticksaver edge). Me, 16, gigging in 1977. Yes, I'm using the snare as a tom. As I was planning this project, however, something odd happened. My idea of exactly recreating my original kit, evolved into making a kit that was more like what my little kit could have grown up to be. So instead of a jazzy little 4 piece, it grew into a 9 piece prog-looking kit that Neil Peart might feel at home playing. Dang it! I'm gonna need a lot more of those expensive Gretsch lugs.